After hearing so many people rave last year about their wonderful R.I.P. Challenge reads of the classic suspense novel Rebecca, I added it to my list of books to read for this year's challenge. I hadn't read it in years, and this time I opted for the audio version. It turned out to be a good choice; the narrator was very good (she reminded me a bit of one of the women who read the audio version of The Thirteenth Tale, another great "listen"), and between each chapter there was some intensely melodramatic violin music which really added to the spooky mood. The premise, for the three of you out there who have yet to read this wonderful book, is that a young, unnamed woman with no family, working as a "companion" for an unpleasant, wealthy woman, has a whirlwind romance with an older man named Maximilian (Maxim) de Winter. The heroine is besotted with him, and they have a lovely honeymoon. But when they return to his home in Cornwall, Manderley, everything changes. For one thing, everywhere she looks she sees reminders of his first wife, a beautiful, vivacious woman who drowned less than a year earlier. 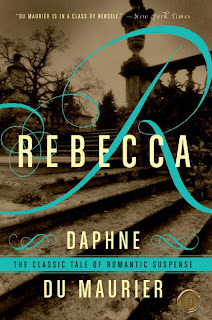 The heroine is intelligent but timid and self-effacing, and everywhere she looks she sees reminders of the amazing, wonderful Rebecca, a woman it seems she can never live up to. Complicating matters is the presence of the malicious, dour housekeeper, Mrs. Danvers. This is an atmospheric, exciting, character-driven suspense novel, and it is the perfect read for a dark and windy October - or November - evening. It is not a romance novel in the genre sense, but there is romance in it, and also mystery and plenty of tension. I remembered identifying very much with the heroine when I first read this novel, and that's not surprising, as I was probably a teenager then. I was surprised to find myself growing a bit impatient with her this time around, as she hides behind doors to avoid having to meet visitors to the house and allows herself to be so bullied by the horrible Mrs. Danvers. Still, she does grow and change, and it is entirely believable that she'd behave the way she does, given her personality and social position. Maxim's carelessness of her irritated me, and I did not find him to be as compelling a character as I did so many years ago. It's funny how experience, age and perspective can make a reading experience a little bit different with each reread. At any rate, I highly recommend this to anyone looking for a bit of creepy suspense and Gothic atmosphere - maybe for next year's R.I.P. reading challenge! Here, There and Everywhere: "There's love, there's deception, there's mystery...and then there's Mrs Danvers, making sure Rebecca remains in every room on every chair in the house..... it just has it all, and I believe you will find that once you begin to read this book, that you will not want to put it down." My Friend Amy: "It's a delightful exploration of self, perception, and truth. It's beautifully written and though once or twice it felt too long, I felt such affection for the characters, that I didn't mind." Stuff as Dreams Are Made On: "This book reminded me so much of The Thirteenth Tale and The Historian. If you liked the atmosphere of those books, I think you’d enjoy this one. Like those two, this one does a wonderful job of telling its reader a riveting story. Things Mean a Lot: "The mood couldn’t have been more perfect. I also loved the pacing, and I found the story suspenseful even though I already knew what happened at the ending." Where Troubles Melt Like Lemon Drops: "What I loved most about Rebecca is the language, Du Maurier's innate ability to write beautifully yet in a way that does not age nor seem dated, and the tension, the suspense." I'm glad you liked it! I like the cover you've posted here as well - mine is bright red with the swirly R, and it looks a bit trashy to be honest. When it's not the least bit trashy in reality! Just thrilling. I loved this book. It amazes me we, as readers (or at least this reader! ), bought in to the "Maxim is a nice guy" message the Du Maurier so artfully weaves. He's a murderer! The Hitchcock movie is great in an of itself, but it frustrates me that its sympatheic slant toward Maxim actually alters the story line slightly. Rebecca's death comes across as an accident when it was anything but. I really need to read this. It is on my TBR pile, so I really have no excuse! Jenny - I'd never seen this cover before (mine was an MP3 version I downloaded from my library's website), but I think it gives a much better idea of the book than that red cover! Caroline - I read somewhere that the movie had to change the ending because of the Hollywood Production Code would have required Max to be punished if he had murdered his wife. So that's why they changed the ending - interesting, eh? So glad you liked this book Darla! I truly believe this is a classic everyone should try reading. I can't imagine anyone not loving at least something about it. I read Rebecca not too long ago (a few years back), but it was before I started blogging. And I enjoyed it. But the hype was so high, I actually think I enjoyed My Cousin Rachel more. I also really liked Jamaica Inn. At any rate, du Maurier is a first-rate gothic Queen, and one hell of a writer! Stephanie - I'm ashamed to admit this is the only book by du Maurier that I've read! I'll have to try My Cousin Rachel next, since you liked it so much. Thanks for the tip!